Every Spring the SLO Vintners Association has a weekend long event, Roll Out the Barrels that focuses on the San Luis Obispo and Edna Valley wine regions; with a kick off music, food and wine event in the Mission Plaza naturally called Barrels in the Plaza. The wineries literally “roll out” their latest offerings and various local restaurants provide the food and well-known local bands provide the music for this Grand Tasting event. 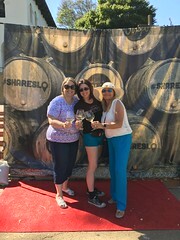 In previous years, though I have gone to the winery open houses and events, this year was the first time I got to attend in the Plaza. It was a great time. We (my bff Lori and I) got VIP tickets, connected up with Laura (101 wine tours) and arrived a bit early around 4; the doors opened at 4:30. So we decided what the heck, we have time, let’s check out the new Barrel House Speakeasy a couple of store fronts down until the doors to the event opened. Once it was time to head over to the event we grabbed our plates and glasses and headed into start tasting. I was so excited that there were a couple new wineries (7 Angels Cellars and Chene) in attendance that I hadn’t tried, and they had some really nice wines. There were also some standbys we are very familiar with Sinor LaValle, Wolff, Kynsi, Baileyana (with some of their other labels) and Claiborne and Churchill. Center of Effort (CoE) who now occupies the old Corbett Canyon Winery property was pouring their Pet Nat (more on that in my future blog post on the 2016 Chardonnay Symposium), and Maegan Loring chef at Niner Wines made a cold avocado soup that was paired with their wines. Aside from the wineries there were also multiple restaurants in attendance. There was some great cheese and pate provided by Fromagerie Sophie, great sausages from Cattaneo Brothers, and many others. We had a great time going from tasting booth to tasting booth checking out all the latest releases. The following we day we went to open houses at Piedra Creek, Wolff Vineyards and Claiborne and Churchill. 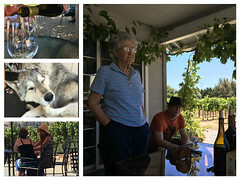 We stopped by Piedra Creek and had a tasting with Margaret out on the patio and then headed over to Wolff to do taste the wines and where they had a wolf hybrid named Shiloh for everyone to meet. Shiloh is a rescue at Whar Wolf Rescue and is a wonderful Ambassador for the organization. Then it was over to Claiborne and Churchill for their blind white wine tasting event. I will proudly tout that my husband, was the ONLY person that got all 5 wines correct (yeah, I admit, I didn’t get them all) the entire day, beating out the Assistant winemaker and the 2 owners! ROTB is a great weekend event; a perfect reason to come to SLO Wine Country for a short jaunt vacay (if you are in CA lol), over a long weekend. It’s also a great opportunity to explore and experience our wonderful town. See ya at ROTB2017!